e Sons of the Desert of NYC, and Rick Scheckman & Mark Trost of F.I.L.M. Archives. Our heartfelt thanks to them for making this season possible by allowing their precious and valuable prints 'out to play'. If Mack Sennett was "The King of Comedy" then Hal Roach was its "Crown Prince." After starting as an extra in 1914, Roach was instrumental in making Harold Lloyd a comedy star, and along the way developed a school of comedy that consisted of recognizable everyday people trapped in outlandish and embarrassing situations. Today’s selection of 1927 releases includes the Stan Laurel vehicles DUCK SOUP, EVE'S LOVE LETTERS and WHY GIRLS LOVE SAILORS, plus Max Davidson in JEWISH PRUDENCE and Charley Chase in THE STING OF STINGS. Johnny Hines was a very popular clown who made many Harold Lloyd-type of comedy features in the 1920s, but is unjustly overlooked today. CONDUCTOR 1492 (’24) gives a good look at Hines’ ability with sight-gags, not to mention his engaging smile, and breezy personality. Opening for the feature is Glenn Tryon, another neglected clown, in the Hal Roach short WHOSE BABY ARE YOU? (’25). When the cinema began every film was a short subject, but as the industry grew so did the length of its films and shorts became a pre-feature special attraction. Comedy shorts were a standard part of the typical theatre bill, and this program provides a wide sampling of the art form. Our line-up is Ben Turpin in LOVE’S OUTCAST ('21), UP ON THE FARM ('25) with Lee Moran, Lupino Lane in MOVIELAND ('26), WHAT! NO SPINACH? ('26) with Harry Sweet, and Snub Pollard as THE OLD SEA DOG (’22). 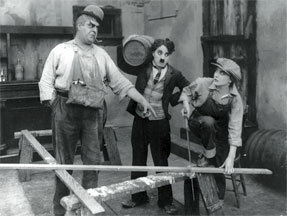 Throughout the silent era there were numerous "fun factories" that specialized in producing and distributing silent comedy one and two-reelers. From giants like Sennett and Christie to micro units like Tenneck – they all worked overtime to supply a steady stream of movie laughter. Our cross-section of producers include Harry Cohn (Sid Smith in A DOG-GONE MIX-UP, ’21,), Larry Darmour (Mickey McGuire in MICKEY’S CIRCUS, '27), William Fox (Arthur Housman in JUST A HUSBAND, '27), Louis, Adolph, & Max Weiss (Ben Turpin in THE EYES HAVE IT, '28), and Hal Roach (Snub Pollard in STRICTLY MODERN, '22, and Stan Laurel in COLLARS AND CUFFS, '23). Known as “The King of Comedy,” Mack Sennett was actually the Henry Ford of slapstick, as he was the first person to create a film studio devoted to turning out comedies on an assembly-line schedule. The main targets for the rough and rowdy Sennett crew were order, pomposity, and social standing. Having discovered most of the big names in the genre, today’s sampling highlights the year 1926 and stars such as Billy Bevan, Ralph Graves and Ben Turpin in the shorts WHISPERING WHISKERS, HUBBY’S QUIET LITTLE GAME, YANKEE DOODLE DUKE, WHEN A MAN’S A PRINCE, and ICE COLD COCOS. Tramps (a.k.a. 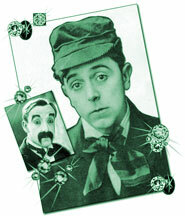 “Knights of the Road”) were popular comic characters on stage, in comic strips, and in early films. While Charlie Chaplin used it for his regular screen persona, most of the other big name comics spent some time cinematically "on the bum". Today’s down-and-outers include Roscoe "Fatty" Arbuckle in Fatty's New Role ('15), Charlie Chaplin’s Easy Street ('17), Harold Lloyd in From Hand To Mouth ('19 ), Buster Keaton’s The Goat ('21), and Fiddlesticks ('27) with Harry Langdon. Lloyd takes on healthcare! Keaton takes on Wall St! 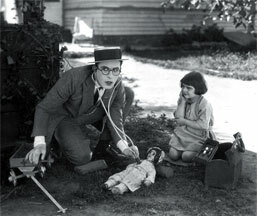 Remembered today as the "third genius" of silent comedy, Harold Lloyd was always first at the box office. Dr. Jack ('22), although not as well known as Grandma's Boy ('22) or The Freshman ('25), is equally funny and presents Harold as a country doctor who uses scares and thrills to help a young rich girl get rid of parasitic doctors. Also on this Halloween program is Buster Keaton surrounded by eerie goings-on in The Haunted House ('21). 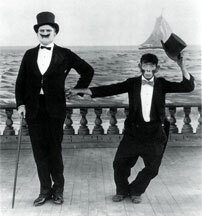 Since most of the silent film comedians came from the stage, it was only natural that they would use their theatre background and experiences for comic material. Tough company managers, over-ripe melodramas and fly-by-night theatre troupes are some of the subjects at hand today in the Thanhouser company’s The Soap Suds Star (215), Charlie Chaplin’s The Property Man ('14), The Play House ('21) with Buster Keaton, Charley Chase’s Bromo and Juliet ('26), and Lupino Lane in Drama Deluxe ('27). The second part of our Show-Biz programs finds our silent clowns poking fun at themselves and their style of filmmaking. Nothing could be simpler or handier (not to mention cheaper) than using their own studios as background for slapstick antics, which today gives us precious behind-the-scenes glimpses of where and how these films were made. On the bill is Everett True Breaks into the Movies ('16), Charlie Chaplin’s Behind the Screen ('16), Hey There ('18) with Harold Lloyd, Our Gang’s Dogs of War ('23), and The Daredevil ('23) starring Ben Turpin. Sunday, December 6 at 2pm – at the Museum of the City of N.Y.
Laurel & Hardy: U-Pick 'Em! After years of solo work, Stan Laurel and Oliver Hardy came together at the Hal Roach Studio in 1927.In their comedies human foibles and the frustrations of everyday life were magnified a hundred times over. Now you have the opportunity to select which of their silent shorts you’d like to see. Vote online on our website, and the four finalists will be screened at this show! Click here to go to our online voting page to send in your picks! Harold Lloyd in "Grandma's Boy"
Remembered today as the “third genius” of silent comedy, Harold Lloyd was first at the box-office in the 1920s. In GRANDMA’S BOY (’22) Harold found the way to mix real heart with laughs, and cemented his place as one of the leaders and innovators in the field of screen comedy. Extra added attractions are Charley Chase in THE FRAIDY CAT (’24) and the cartoon SICK CYLINDERS (‘28) with Oswald the Lucky Rabbit. Charley Chase was the matinee idol of the silent clowns, whose penchant for embarrassing situations made him the put upon everyman of the Hal Roach studio. Our selections follow the beginnings of his career to its maturity with the shorts A VERSATILE VILLAIN (’15), HE WOULDN’T STAY DOWN (’15), HARD KNOCKS (’24), SITTIN’ PRETTY (’24), MIGHTY LIKE A MOOSE (’26) and the talkie HASTY MARRIAGE (’31). John Barrymore in "Dr. Jekyll and Mr. Hyde"
Our Halloween feature stars “The Great Profile” John Barrymore in one of the most famous versions of this often filmed tale. Having mostly appeared in light comedy films Barrymore seized this dramatic opportunity, relishing the story’s creepiness and performing the legendary transformation scene in an unbroken take. Opening for Mr. Barrymore are Mr. Laurel & Mr. Hardy, who have their own scary problems in the two-reeler HABEAS CORPUS (’28). Douglas Fairbanks in "The Three Musketeers"
For this program our silent clowns take a break and give the stage over to Douglas Fairbanks, who was the greatest swashbuckler of early cinema. Not only is THE THREE MUSKETEERS (’21) one of Doug’s best films, but D’Artagnan was his favorite role, which he played again in his last silent THE IRON MASK (’29). Also on tap is Felix the cat hobnobbing with movie stars in FELIX IN HOLLYWOOD (’23). Shorts tailored to the holidays have long been a cinema tradition. Comedies such as THE COURTSHIP OF MILES SANDWICH (‘23) with Snub Pollard covered Thanksgiving, while Christmas was taken care of by films like Charley Chase’s THERE AIN’T NO SANTA CLAUS (‘26). Our sampler of Yuletide cheer includes: OLD SCROOGE (’13) with Seymour Hicks, Our Gang in GOOD CHEER (’26), the Laurel & Hardy classic BIG BUSINESS (’29), plus a few surprises. 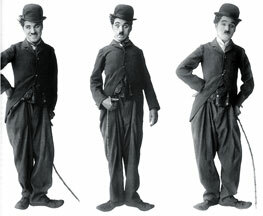 When Charlie Chaplin became famous as the “Little Tramp” he wasn't content to have his character just be a figure of fun, so he developed Charlie into a comic underdog, hero, and lover. Sometimes a henpecked husband or a rejected suitor, this program - His Trysting Place ('14), A Jitney Elopement ('15), The Bank ('15) and The Vagabond ('16) - takes Chaplin from his Keystone beginnings, through Essanay, to his classic period at Mutual. 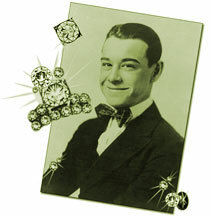 Harry Langdon made his movie debut in 1924 and his career blazed brightly until 1928. Forgotten for many years, today he's considered one of the era's most original clowns, and his feature The Strong Man ('26) was just added to the National Film Registry. Our Langdon sampler – Feet of Mud ('24), Remember When? ('25), Lucky Stars ('25) and Fiddlesticks ('27) – are some of the early Mack Sennett shorts that made him famous. 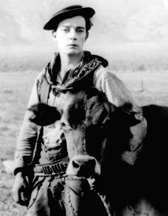 Buster Keaton in "Seven Chances"
While The General ('27) is probably Buster Keaton’s most famous film, Seven Chances ('25) is also one of his best that features great gags and breathtaking stunts. Having to marry by 7 o'clock to get his inheritance, Buster must brave a stampede of angry brides and rolling boulders to do it. Opening the show is forlorn Harry Langdon who has his own wedding troubles in His Marriage Wow ('24). Never heard of Tyler Brooke? Along with Stan Laurel and Oliver Hardy, this forgotten clown was a member of the late 1920’s Hal Roach “All Stars” and our selection – Dizzy Daddies ('26), The Merry Widower ('26), Should Husbands Pay? 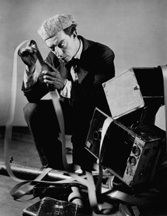 ('26) and On the Front Page ('27) – highlight his talents and contribution to film comedy. Hosted by film historian and Brooke biographer Charlie Morrow. The Hal Roach Studio was known as “the Lot of Fun,” where human foibles and the frustrations of everyday life were magnified a hundred times over. Film historian and author Ed Watz will introduce our salute which showcases two comedy teams that came together at Roach at the very end of the silent era – Laurel & Hardy in From Soup To Nuts ('28) and Their Purple Moment ('28), plus Anita Garvin & Marion Byron in Feed 'em and Weep ('28) and A Pair of Tights ('29). Remembered as the “Third Genius” of silent comedy, Harold Lloyd was always first at the box office. 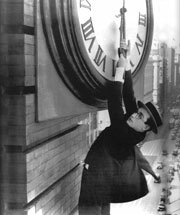 Safety Last (’23) is not only his most famous film, but the image of Harold hanging from the clock is one of the most indelible bits of movie iconography. 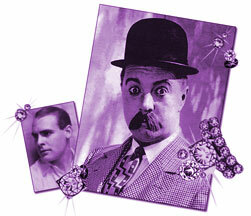 Also on the program is Lloyd’s high and dizzy warm-up, Never Weaken (‘21). Although Mabel Normand is the most famous female name in silent comedy, she’s better remembered for the scandals she was linked to than for her deft comedic talents and lively screen presence. To highlight both her dramatic and comic skills we’re presenting The Nickel Hopper (‘26), followed by her 1921 Goldwyn feature What Happened to Rosa? Our Halloween feature, The Cat and the Canary (’27), mixes chills with humor for a tongue-in-cheek whodunit. One of the first of the Universal horror films, the atmospheric camerawork and set design set the tone for films such as Dracula (’31) and Frankenstein (’31) that would follow. Our Gang’s antics open the show in Shootin’ Injuns (‘25). Our silent clowns take a brief break so that we can present the first epic of the air, which not only won the very first Academy Award for Best Picture, but was the only silent film to ever do so. Based on director William Wellman’s own experiences as a flyer in World War I, Wings features incredible camerawork and action scenes still unrivaled in these days of modern digital effects. 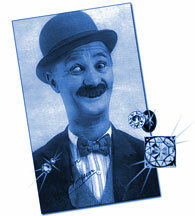 Before his 1927 teaming with Oliver Hardy, Stan Laurel had toiled away for ten years as a solo comic. A number of those days were spent working at the Hal Roach studio, and our salute to solo Stan is made up of the early comedies Just Rambling Along (’18) and Hustling for Health (’19), plus a string of 1923 shorts: The Noon Whistle, White Wings, Kill or Cure, Oranges and Lemons, and Frozen Hearts. In 1988 the Library of Congress established the National Film Preservation Board, which in turn created the National Film Registry. Every year since then the Registry has chosen 25 films that fit the criteria of being “culturally, historically and aesthetically important.” The selectees encompass a wide range of films – from logical shoo-ins like Citizen Kane ('41) and Casablanca ('42) to the early sound oddity Gus Visser and his Singing Duck ('25) – and include a number of silent comedies. This season we’re taking a look at some of the silents honored, while endeavoring to bring focus to other deserving comedies and performers that haven’t yet made the cut. Our opening program is a series of comedy shorts that have been deemed national treasures by the Registry, and we certainly second the motion. The classics getting the nod are Charlie Chaplin’s The Immigrant ('17), Fatty’s Tintype Tangle ('15) with Roscoe "Fatty" Arbuckle, Laurel & Hardy’s well-known Big Business ('29) and the often over-looked Max Davidson in Pass the Gravy ('28). The General ('27) is not only Buster Keaton’s most highly praised and famous film, but was one of his own personal favorites. So accurate that it looks like Matthew Brady Civil War photographs come to life, Buster nevertheless made sure that the film is as funny as it is authentic. Extra-added attraction Cops ('22) has Buster on the lam from the entire Los Angeles police force. "The Son of the Sheik"
This week the clowns take a break, and a silent era idol steams up the screen. Rudolph Valentino became the romantic movie icon of the early 1920's, and set the standard of Latin lovers for the rest of the decade. Tragically dying at age 31, The Son of the Sheik ('26) was his last film and an ideal showcase for his screen chemistry. First on the bill is the experimental short film H20 ('29). Before becoming the silent screen’s foremost swashbuckler Douglas Fairbanks was a popular comedian. Breezy and fast-paced, his comedies spoofed conventions of the day. The registry-selected Wild and Woolly ('17) takes on the Horace Greeley ethos of “Go west, young man,” plus the already-set movie clichés of the Wild West. Opening the program for Doug is Edwin S. Porter's innovative early western The Great Train Robbery ('03). Forgotten clown Lupino Lane was a huge star of the stage and screen, in addition to being one of the greatest acrobats ever captured on film. None of his action-packed comedies, full of funny gags and eye-popping stunts, has made the registry’s list yet, but here’s a chance to check him out and write in a nomination. Our L.L. sampler includes Maid in Morocco ('25), Who’s Afraid? (27), Hello Sailor ('27) and Good Night Nurse ('29). The first animated cartoon was released in 1906, and to celebrate this milestone we have a selection of early cartoon stars such as Koko the Clown in Koko's Earth Control ('28), Oswald the Lucky Rabbit in Sick Cylinders ('28), and Felix the Cat in Two Lip Time ('26); plus a live re-creation of Windsor McCay’s Gertie the Dinosaur ('14) vaudeville act. Rounding out the bill are the live-action cartoon-style antics of Ben Turpin in A Clever Dummy ('17) and It’s A Gift ('23) with Snub Pollard. Our clowns take a break for this special Halloween program in which we present the original 1925 classic. Star Lon Chaney is remembered for his elaborate make-ups in horror roles such as this and The Hunchback of Notre Dame ('23). Known as “The Man of a Thousand Faces,” he played everything from legless gangsters to Chinese laundry men, with an intense dedication that made him the cinema’s first method actor. Score will be performed on theatre organ. The legendary Louise Brooks has her own centennial on Nov. 14th, and to mark the occasion we present her 1926 comedy Love 'Em and Leave 'Em. Made at Paramount's Astoria Studio (today the Kaufman-Astoria Studio), Louise plays a girl who “innocently” gets ahead by dating influential men, including her own sister’s boyfriend. Also in the cast are Evelyn Brent, Lawrence Gray and Anthony Perkins' dad Osgood. NOTE: this SCFS special event will be held at the Museum of the City of New York, located at Fifth Ave & 104th Street, NYC. Visit the MCNY website for further details. Tickets are $9 for adults and $5 for members. This salute to some very funny comics who have gotten lost in the shuffle with the passage of time is headlined by neglected comedienne Fay Tincher in Ethel’s Roof Party ('14), and Don’t Tell Everything ('27) with Max Davidson and Spec O’Donnell. Also on the bill: Snub Pollard in Fully Insured ('23), Hop To It! ('25) with Bobby Ray and Oliver Hardy, Monty Collins in Three Tough Onions ('28) and Snooky’s Fresh Heir ('21) starring Snooky the human-zee. The house façade falling on Buster Keaton in Steamboat Bill Jr. ('28) is one of the most recognized and evocative images of silent comedy. But Buster’s films are filled with similarly amazing “how did he do that” moments that are as integral a part of his comedy as his famous deadpan. Special guest speaker Cliff Cronan, a stuntman and Keaton scholar, will talk about how Buster did what he did, showing clips and the classic shorts: Convict 13 and The Paleface. Charley Chase was the matinee idol of the silent clowns, whose penchant for embarrassing situations made him the put upon everyman of the Hal Roach studio. After many years as one of the era’s most overlooked masters, he’s gotten some well-deserved attention due to some recent DVD releases. Our selections (most of which are not available on DVD) take Chase from his "Jimmy Jump" one-reelers through his peak period of two-reelers. The program: Hard Knocks ('24), Stolen Goods ('24), The Rat's Knuckles ('24), Looking For Sally ('25), Fluttering Hearts ('27), and Limousine Love ('28). Keaton’s first starring feature for MGM, THE CAMERAMAN ('28), finds him as a timid New York City tintype photographer who aspires to be a newsreel man. Partially shot on location in NYC, there’s great footage of 5th Avenue and Yankee Stadium. Buster also opens the show with BLUE BLAZES ('36), one of his talking Educational comedies that was made just across the river in Astoria, NY. for this program only: film program is free with museum admission – $7 for adults, $5 for seniors, $15 for a family. 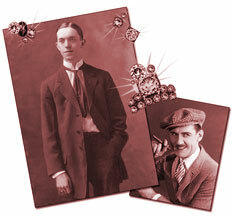 All remaning programs in March and April are presented at the New-York Historical Society. Click on "theater/tkts" for details. THREE AGES (’23) was Keaton’s leap from shorts into feature films, and chronicles his misadventures in the Stone Age, Roman Era and modern day (well...1920's). Epoch-bending slapstick is explored further by Laurel & Hardy in FLYING ELEPHANTS ('28) and ROAMING ROMEO ('28) with Lupino Lane and Wallace Lupino. 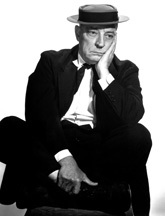 Buster Keaton and the "Comedy Grapevine"
Ideas never exist in a vacuum, particularly in the world of silent comedy. Gags, routines and whole plots turn up in myriad films, each one given a personal spin by the comic mind doing the re-using. This program affords the opportunity to take at look at some of Keaton’s similarities, and differences, with his contemporaries Billy Bevan, Snub Pollard, and Laurel & Hardy. We’ll compare COPS ('22) with BE REASONABLE ('21), THE GOAT ('21) to PUNCH THE CLOCK ('22), and ONE WEEK ('20) to THE FINISHING TOUCH ('28). Keaton was the hardest working of the classic film comedians. He certainly had the most eclectic career of them all and from his first film appearance in 1917, never stopped working till the day he died in 1966. This whirlwind tour through Buster's career features THE BALLOONATIC ('23), rarely-screened sound shorts such as ONE RUN ELMER ('36), later television work from the 50's and 60's, and concludes with his full color swan song, THE RAILRODDER ('65).